Apple has issued its 2011 "Supplier Responsibility" report, in which the iPhone maker reveals it terminated business with a facility that employed 42 underage workers, and explains how it responded to suicides at a Foxconn plant and n-hexane exposure to 137 workers. In the annual report, Apple revealed that the company discovered a total of 49 underage workers across 9 facilities overseas. One of the facilities had the lion's share of child labor, with 42 underage workers. "We required the supplier to support the young workers' return to school and to improve their management systems to prevent recurrences," the 2011 Apple Supplier Responsibility 2011 Progress Report reads. "Apple has terminated business with the facility." The audit also uncovered one case of bribery, where a facility manager offered cash to Apple's third-party auditors and asked them to reduce the number of audit filings. Apple also ceased business with that factory. The annual report also dedicates a section the incident in which 137 workers at a Wintek facility were exposed to n-hexane gas, a poisonous chemical that can cause nerve damage and paralysis in humans. Apple required the facility to discontinue the use of n-hexane, to fix its ventilation systems, and to implement improvement to their management systems. Apple noted that all affected workers were successfully treated, and the company continues to monitor their medical reports until full recuperation. Further, Wintek has paid medical treatment, meals, and foregone wages for sick or recuperating workers, while a majority of the 137 affected employees have returned to work at the same factory. Another entire section of the report is devoted to suicides at Foxconn, Apple's largest overseas manufacturer. A number of suicides at the company's major plant in the southern city of Shenzhen, China, gained public scrutiny in 2010. The audit reveals that Apple Chief Operating Officer Tim Cook and other company executives were joined by two "leading experts" in a visit to the Shenzhen factory in June 2010, where they met with Foxconn Chief Executive Terry Gou. Apple also commissioned an independent review by a team of suicide prevention experts, in which more than 1,000 workers were surveyed about their quality of life, sources of stress, psychological health and other work-related factors. The independent team commissioned by Apple "commended Foxconn for taking quick action on several fronts simultaneously, including hiring a large number of psychological counselors, establishing a 24-hour care center, and even attaching large nets to the factory buildings to prevent impulsive suicides." The team also recommended improvements at Foxconn, such as improved training of hotline staff and care center counselors and better monitoring to ensure effectiveness. The recommendations were added to Foxconn's long-term plans for addressing employee well-being. "Apple will continue to work with Foxconn through the implementation of these programs, and we plan to take key learnings from this engagement to other facilities in our supply base," the report reads. 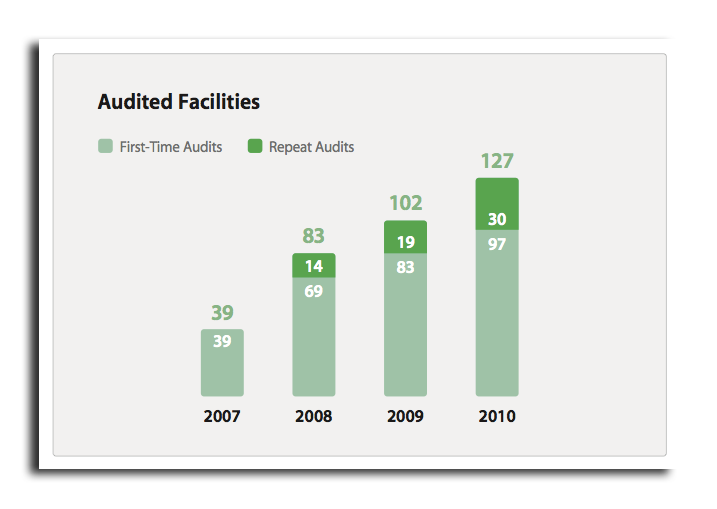 Apple conducted a total of 97 first-time audits in 2010, along with 30 repeat audits for a total of 127 —the company's most audited facilities in one calendar year. The Cupertino, Calif., hardware maker has audited 277 supplier facilities since 2007. The company noted that as a result of its "audits and rigorous standards," $3.4 million in recruitment fee overcharges have been reimbursed to workers since 2008 for "involuntary labor." The report noted that immigrants who move from their home country to work in factories in another country are often charged "exorbitant fees that drive them into debt," and that Apple is working to address the problem.